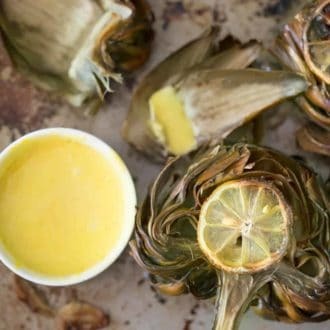 Easy to make roasted artichokes with lemon and garlic are guaranteed to please especially when paired with my zesty aioli! 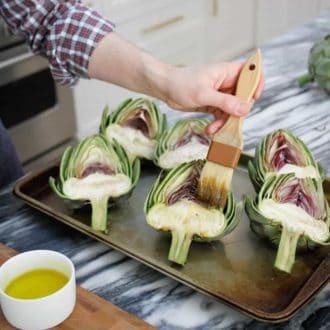 Steaming artichokes seems like the most common way to prepare this gigantic edible flower but roasting them yields more flavor and allows to you season them so you could even enjoy without a dipping sauce. I however couldn’t help myself and had to whip up a batch of lemon aioli infused with some of the garlic I roasted in the artichokes, so addictive! 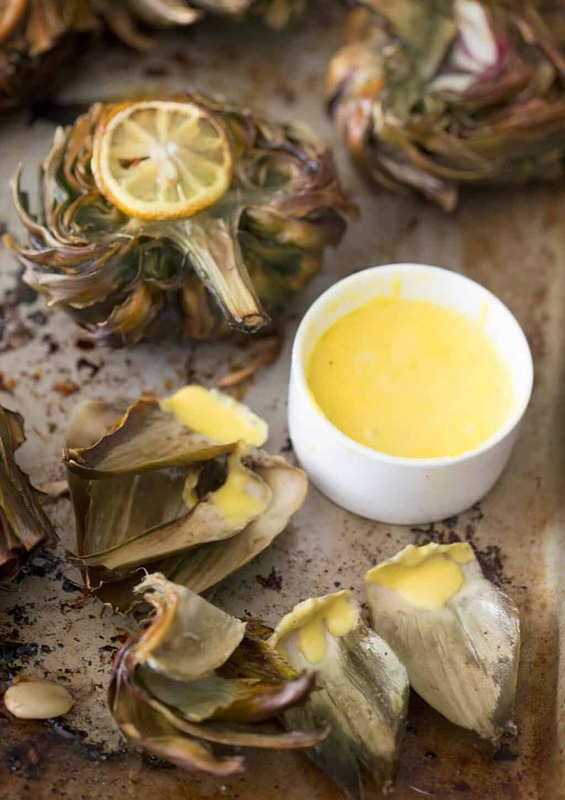 Easy to make roasted artichokes with lemon and garlic are guaranteed to please especially when paired with my zesty aioli! By the way, this aioli is pretty easy and totally addictive. I could add this to any number of things including toast, sandwiches, fries and pasta. 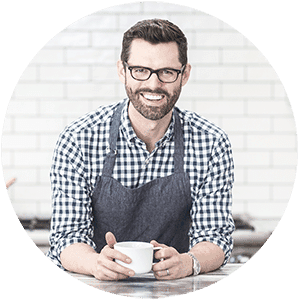 What do you use aioli on? 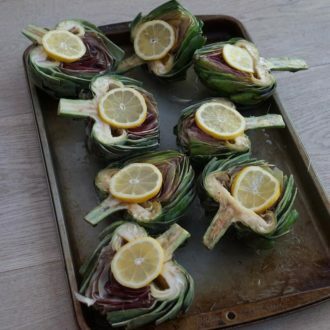 What is the best way to cook artichokes? Steaming artichokes seems like the most common way to prepare this gigantic edible flower but roasting them yields more flavor and allows to you season them so you could even enjoy without a dipping sauce. How do you eat roasted artichokes? 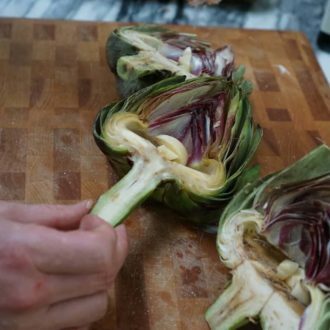 Use the petals of the artichoke as scoops for whatever dip you’re using. Place the fleshy bottom part in your mouth, bite down and pull the petal away. Your teeth will scrape off all that delicious flesh and you wont have to worry about the fibrous part. The Delicious heart can be eaten with a fork and knife, just make sure you have removed all the fur. Click Here for my artichoke dip ravioli! It is my all time favorite filled pasta! Side note: My mom would always serve our artichokes with that onion powder you mix with sour cream. That stuff was what little kid dreams are made of! So If you don’t have time to blend up an aioli just serve with whatever dipping sauce your family loves! How long do you roast artichokes? Bake at 400F cut side down for about 15 minutes. Remove from oven, cover in foil, and bake an additional 25-30 minutes or until tender. Hope you enjoy! 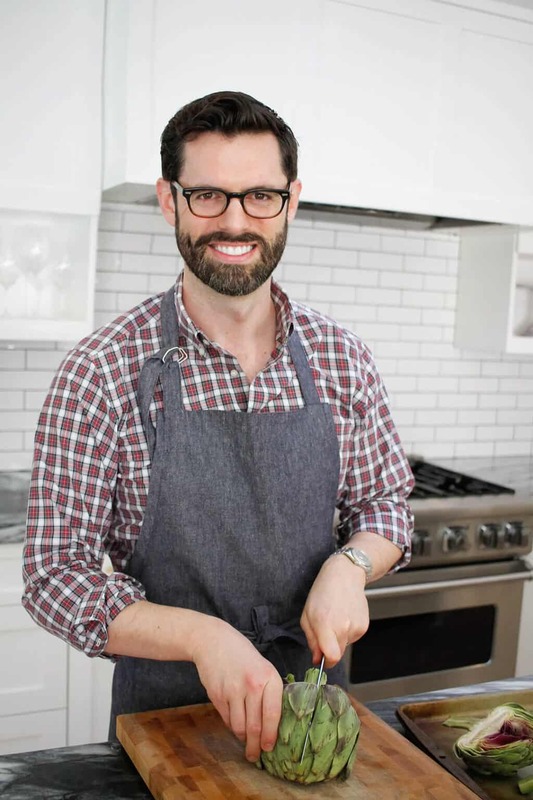 Comment below with any questions or give me your favorite way to eat artichokes! 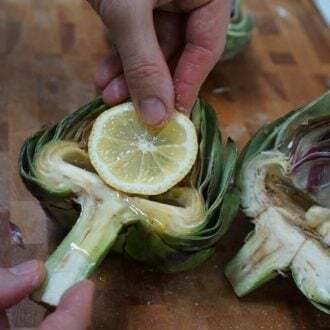 If you’ve tried these artichokes then don’t forget to rate the recipe and let me know how you got on in the comments below, I love hearing from you! Perfectly easy roasted artichokes flavored with garlic and lemon. Paired with a zesty aioli sauce. 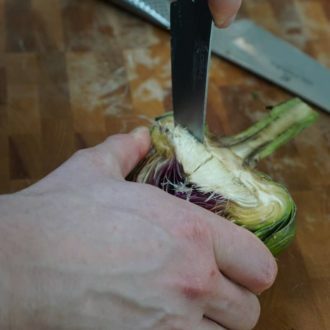 Trim the pointy ends of the artichoke. Halve and scoop out the insides. Place 1-2 cloves of smashed garlic in each. Drizzle olive oil liberally on the inside. Sprinkle with salt and top with lemon slice. Turn artichoke halves cut side down using the lemon wedge to hold the garlic in. Bake at 400F cut side down for about 15 minutes. Remove from oven, cover in foil, and bake an additional 25-30 minutes or until tender. Blend egg yolks, garlic, lemon juice, salt and pepper until smooth. Add oil gradually. Drizzle over artichokes or pour into a serving dish for dipping. 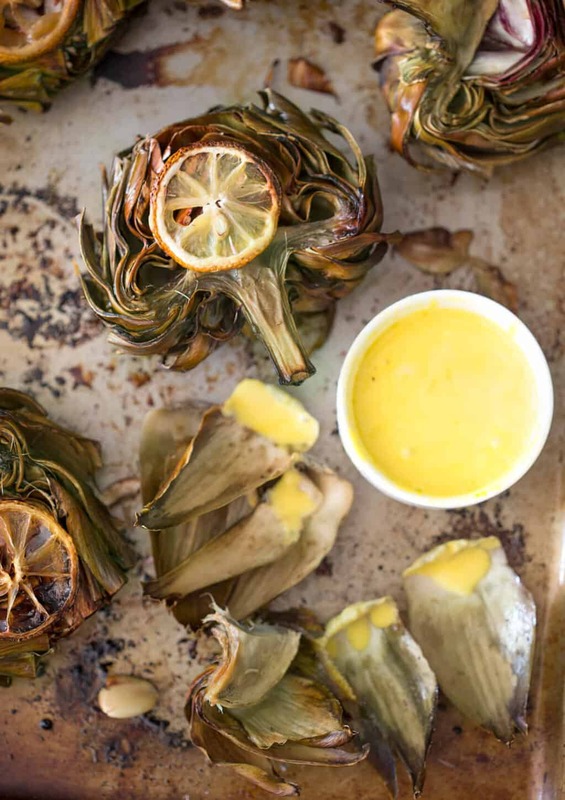 Notes: Make the aioli after you roast the artichokes. You can reuse the roasted garlic cloves. I tried this last night and my artichokes were so good! Never thought to add garlic cloves to the inside! I noticed the instructions (#6) say to wrap the artichokes in foil; this doesn’t happen in the pictures or in the video. If they need to be in foil, can you cover the entire sheet pan or do they need to be individually wrapped? I love artichokes and have had them roasted on a grill, but they were parboiled first. My artichokes came out a little crispier than I wanted them to be when I didn’t wrap in foil! 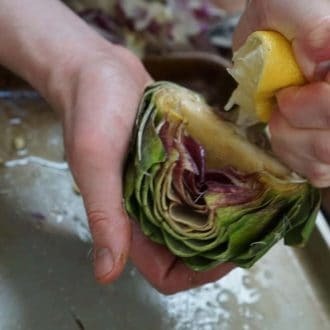 You can cover the pan or wrap each individual artichoke! Hope you enjoy! I’m new to your blog and I’m loving it! Like, loving every single thing!!! The thought of raw egg yolks kind of grosses me out. Any way to cook them a little? Or substitute? If your not into the raw egg yolk, you could gussy up a mayonnaise with garlic and herbs!